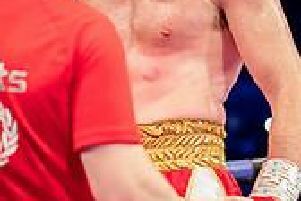 Liam Cameron retained his Commonwealth middleweight title in explosive fashion as he stopped Nick Jenman in the second round. A big right hand towards the end of the round felled Jenman as Manor fighter Cameron made easy work of the first defence of his crown at iceSheffield. The opening three minutes had seen the 27-year-old feeling his way into the fight and sussing out Brighton’s Jenman, who had failed to make the weight the previous day. And Cameron stepped up his efforts in the second, ending the night early with a real statement. Earlier in the night, fellow Sheffield fighter Tommy Frank claimed the Central Area super flyweight title with a comfortable points win over Doncaster’s Craig Derbyshire. Another Steel City boxer, Christian Kinsiona stopped journeyman Curtis Gargano in the fourth of a scheduled six rounds at light heavyweight while Sonny Price won each of the four rounds of his clash with Ibrar Riyaz. For a detailed round-up of the iceSheffield fight night, see Monday’s Star.